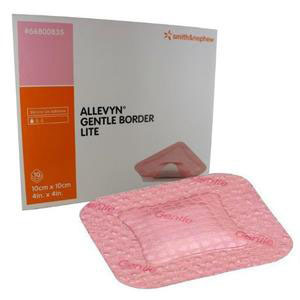 Allevyn™ Life Dressing is a multi-layered design incorporating hydrocellular foam, with hyper-absorber lock away core and masking layer which has been designed for the comfort and well being of patients with wounds. Allevyn™ Life sacrum has a unique tail designed specifically for wounds in the sacral area and fits around the cleft, to help overcome common problems such as the dressing tenting. The dressing has been designed following observational ethnographic research with patients and clinicians who have experience of sacral wounds. Unique quadrilobe shape with a wide border designed to fit the contours of the human body more securely and allows patients to shower. The protective masking layer minimizes the visual impact of strikethrough. Excellent fluid locking under pressure. Provides the patient with peace of mind leakage prevention. Common wound odor absorption when tested on representative compounds. Allevyn™ Life’s multi-layered design provides cushioning and helps to spread pressure. Change indicator optimizes dressing change frequency and minimizes wastage. Indications: Shallow, granulating wounds, chronic and acute exudative wounds, full and partial thickness wounds such as pressure ulcers, leg ulcers, diabetic foot ulcers, malignant wounds, surgical wounds, first and second degree burns, donor sites, skin tears, fungating ulcers, oncological wounds and epidermolysis bullosa wounds.